Chattanooga is a city located in the territory of Tennessee. Chattanooga is the administrative center of Hamilton County. The city is the fourth most populous in the state of Tennessee with a population of about 167 000 people. The city is situated near lakes Chickamauga and Nickajak. Both lakes are part of the Tennessee River. The city is located between the Appalachian Mountains and the Cumberland Plateau. Thousands of years ago in the area now known as the city of Chattanooga, there were tribes. Of them left Chattanooga an ancient name, which translates as a rock around which to live. It is believed that in another translation, this meant the place where the eagle nests. According to other sources, one of the tribes called this place Chattanooga, because the translation meant the place where fish jump from the river itself. The place was inhabited by Indians, who made a living by fishing. Although the Indian village was abandoned, the name was adopted by white people who settled in the area. In 1816 there settled John Ross, who became leader of the tribe of the Cherokee. In 1838 the U.S. government led the American Indians with the Cherokee to move to the area where today the territory of Oklahoma lies. This road became known as the Trail of Tears because it was too long and that the Indians made dear sacrifices as far as the place that was reserved for them. In 1838 the community that was established by white people where the Cherokee lived before, was proclaimed the town Chattanooga. The city was rapidly growing, as it was strategically located – next to the river. In 1850, with the construction of the railway line, Chattanooga grew even faster. The city became known as the place where cotton meets with maize. This was related to the fact that the city was located between the southern states where cotton is grown and southern Appalachians, where maize is grown. During the American Civil War, Chattanooga became the center of a strategic battle. It was the Battle of Chickamauga, which lasted two days. It began on September 19, 1863 after it had ended, thirty-five thousand soldiers were killed. Many soldiers were reported missing because their bodies were never found. The battle of Chattanooga lasted over three days in November 1863, it commenced on 23 November and ended on 25 November. Confederate troops were already on the verge of victory in battle in September, but when the battle continued in November, victory and control over the city, were won by the Union troops. The battles for Chattanooga and Chickamauga were followed by the campaign for Atlanta. After the war, the city became an important rail center and a large manufacturing center. In 1969 it was proven that the air in Chattanooga is the dirtiest air in the country. In the eighties of the twentieth century Chattanooga suffered economic collapse and a wave of unemployment. For this reason, the population of Chattanooga decreased by ten percent. 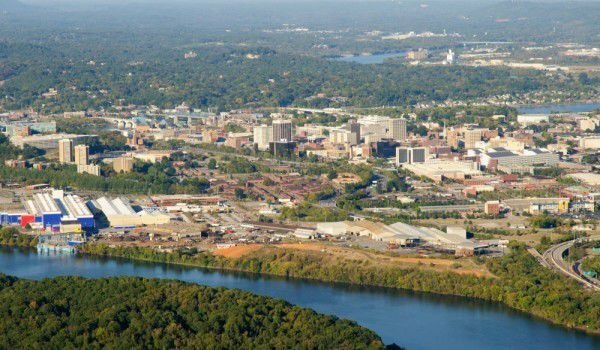 Over the next two decades, however, Chattanooga was able to regain the lost number of inhabitants. In the early twenty-first century, the revitalization of the city started and it turned into a beautiful modern city. Among the restored historical sites was the Walnut Street bridge. It is the oldest surviving bridge of this type within the southeast.